Small server rooms and branch offices are typically unorganised, unsecure, hot, unmonitored, and space constrained. These conditions can lead to system downtime or, at the very least, lead to “close calls” that get management’s attention. 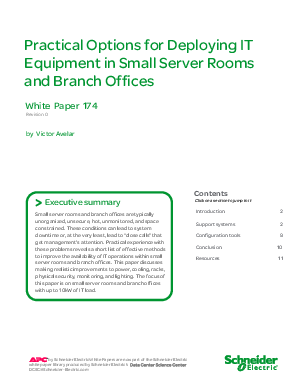 Practical experience with these problems reveals a short list of effective methods to improve the availability of IT operations within small server rooms and branch offices.